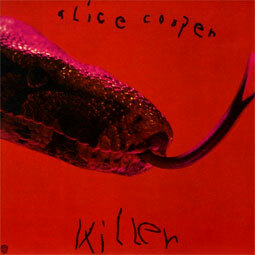 Alice Cooper's 4th album and 2nd release of 1971, KILLER, helped solidify the band's position as rock's most notorious, shocking, violent, sleazy, and theatrical band of the day. Cut from the same musical cloth as its predecessor, LOVE IT TO DEATH, KILLER replaces the space-rock of their earliest releases with blaring hard rock. Also, the band successfully broadened its palette on KILLER by adding orchestrated sounds and synthesizers to the mix.Several tracks would become Alice Cooper staples, such as the vicious "Desperado" (which uses acoustic guitar and a string section to great effect), and the anthemic leadoff track "Under My Wheels." Criticized and misconstrued at the time of the album's release, the eerie "Dead Babies" deals with child abuse--still disturbing stuff all these years later. One of Cooper's more progressive tunes, "Halo of Flies" is an eight-minute-plus highlight, consisting of several different sections, ditto the nearly-as-long closing title track. KILLER is classic Alice Cooper, and would go on to serve as an obvious touchstone for such future rockers as Kiss, White Zombie, and Marilyn Manson. Official 180gr vinyl reisse cut from the original analog master tapes. Gatefold sleeve.